Sorry for taking such a long break. Life just keeps getting in the way, and also we’ve got some more grammar to cover fairly soon and psychologically I think I’m avoiding that. But here’s something that’s grammar-free, mostly: the days of the week. The Persian word for “day” is روز (rūz), and while the full names of the days can be rendered as روز plus the appropriate name from the list below, this is rarely seen. Except for Friday (which comes right from Arabic and signifies Friday’s role as the day for large congregational prayer) and Saturday, these names are all created by simply adding a cardinal number (more on those later) to شَنبه (“Saturday”), so Sunday is literally “one شَنبه,” Monday “two شَنبه,” and so on. “Week” is هَفته (haftah, “haf-te”) from هَفت (haft) or “seven,” and “days of the week” is روزها‌ی هَفته (rūzhā-yi haftah, “ruz-ha-ye-haf-te”). The weekend in Iran and in Afghanistan, where the Dari dialect of Persian is an official language, is Thursday-Friday, but Thursday may be considered a half-day of work depending on where you are and for whom you’re working. Winter = زَمِستان (zamistān, “za-mes-taan”), which certainly looks like it could be related to the Slavic (Russian, Ukrainian, Polish, Serbian, Czech, Croatian, Slovakian, etc.) зима or zima, but don’t quote me on that. Winters in Iran vary quite a bit depending on where you are, from mild along the Gulf and Caspian coasts to quite severe in the western Zagros Mountains. Snow = بَرف (barf, believe it or not). Unfortunately for cross-cultural purposes, the word has also come to suggest anything that is made up of white flakes, like, for example, powdered dish or laundry detergent. 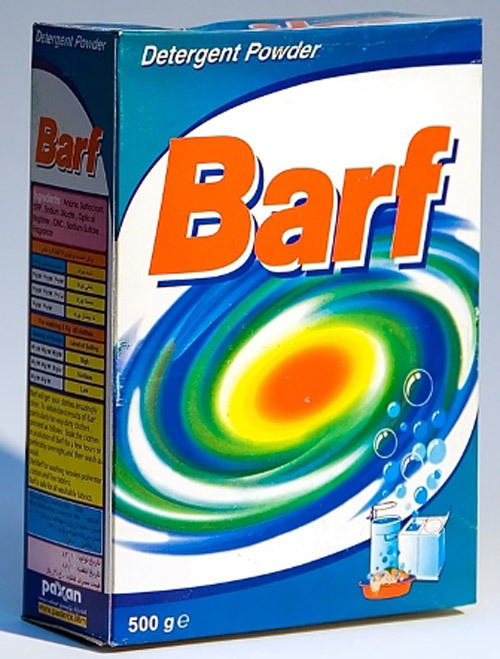 This gives rise to one of the great Iranian consumer products, Barf Detergent. بَرف باریدَن (barf bārīdan) is technically the verbal form, “to snow,” but this is rarely encountered and instead of sentences like “it is snowing,” you’ll see sentences like “there is snow” or بَرف است (barf ast, literally “snow is”). Gets your clothes and dishes surprisingly clean! Rain = باران (bārān) or بارِش (bārish), with the verb باریدَن (bārīdan), “to rain” or perhaps “to precipitate” (meteorologically speaking). Coat = کُت (kut, “kot”), which I trust needs no explanation. A lighter outerwear option would be a ژاکِت (zhākit), which again I assume is self-explanatory.